It was a cute slice of life. The premise was interesting and made for some funny moments occasionally, but outside that it was pretty average. It wasn't bad, but at the same time it didn't really do anything amazing either. If you have time to kill and just want to watch some cute characters derping around, you might like this show. If not, there are better things out there. I originally started watching this show because I was told one character is me, but then I fell in love with the show. It's a good mix of cute, happy, bittersweet, and a little sad. It had a tiny bit of Dangan Ronpa feel, but without the deaths. The art and animation was beautiful. Good, until you actually think about it. When I first watched Anne-Happy, I thought it was pretty great. The unlucky thing is new, the characters and animation looked okay, and it was funny. Well, except for the flat-chest joke. But that aside, it was an all right show. I occasionally listened to the music for the show when I was writing, and then I realized something. The only part of the show I remembered was the music. And no, I'm not kidding. First off- the characters. What were they called again? I can't remember their names or faces. I just remember there was a tsundere, a deadpan loli, a protagonist girl, a happy-go-lucky type, and a sickly girl. Because those have never been done before. So, I went back, watched some of it, forgot the character names again, and decided to write this. Not even worth talking about since it isn't really even there. Possibly the only good part. The music for this show is pretty good, actually. The background music is decent, the OP and ED are great (though the ED did stand out more). One thing that I don't like is the video they put over them. I always hate it when in an OP, the characters are shown 'singing' the song, especially when it's not their character's voice. Because, let's face it, the animation for any lip-sync is always missing the 'a' mouth shape. Guess what? That's one of the most common letters. It's lackluster. If you've seen one slice-of-life show, you've seen them all, and this is definitely true for Anne-Happy. If you've ever seen... say, New Game, you know what this is about. Oh, and don't get me wrong- New Game has bad animation too. I wrote a review there previously, but... here's one way to put it. Turn off the subtitles. Then, now that the biggest distraction is gone, look at the characters. They're barely moving and their mouth movements are minimal. They weren't even trying. And now the main point. The comedy. This is a comedy show. Well, guess what? It's okay. I laughed a couple of times. The issue is that it was only a couple in a show that's about 4 hours long (total). In the 4 hours I spent watching this, I laughed maybe twice. Don't waste your time with this show. You've already seen it if you've ever seen a slice-of-life show before. If you haven't, well, go watch Baka and Test or something, because even if they're not super creative, they got their comedic timing spot-on, unlike this show. 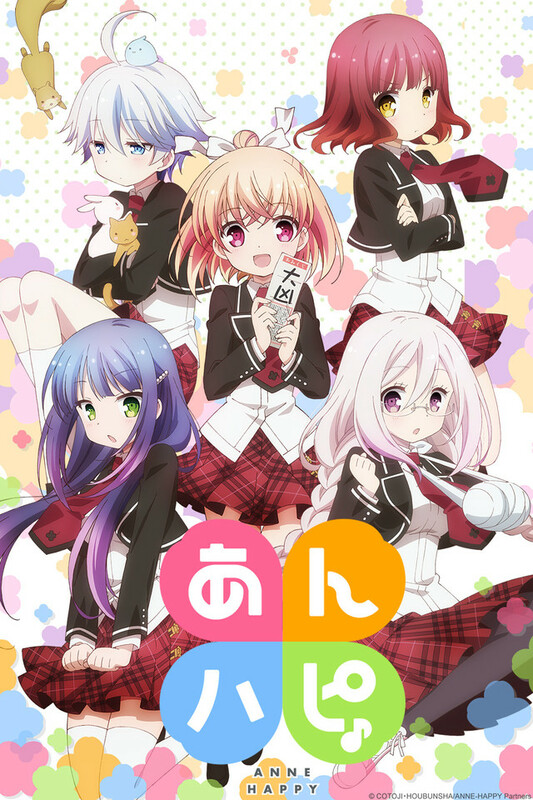 An interesting and amusing concept: a school that collects a class of girls who have terrible luck/karma/abilities just to teach them how to be happy. The teacher leading the class is a hoot, as it's slowly revealed how much of a behind-the-scenes, awesome secret-agent hero she has to be to keep the girls alive. It IS a cliche. This anime is a total cliche. You have a group of girls and they all have fun in their daily lives. No plot whatsoever. What makes this a bit weird, it's that it's a happy-go-lucky anime about. . . unhappy and unfortunate girls? It did NOT make sense to me, which is why I tried to test it out, like why not? I hit bullseye with weird. It's a classroom where the main focus is happiness. I have more questions about the school than answers, and than the anime. but even after the POOP that life throws at her... she is still able to look straight at life with a positive perspective. Even if it's cliche... at least, unlike the others, it has an inspiring theme! Of the Spring 2016 anime this is my winner for best new anime. Cute slice of life with a funny twist. Our five girls here all have a unique fatal flaw that lands them in Happiness Class. To be fair a good portion of users here would probably end up in class 7 as well. You might see the picture here and think of Is the Order a Rabbit? or K-On! but this is a different story altogether. Last thing I'd say about it is that you can find happiness in life, even if you are unfortunate.